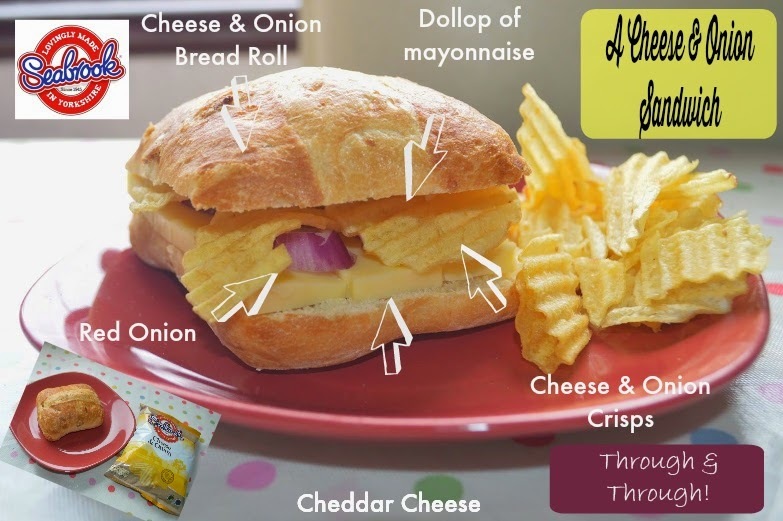 Tots100 Challenged Bloggers to create the perfect crisp sandwich in return for free crisps. A crisp sandwich has always been one of my guilty pleasures so I agreed to take part. One of my favourite student foods was sliced bread, butter and plain crisps. Yum. As I was sent Cheese and Onion flavour Seabrook Crisps then I thought I should do justice to this flavour and make mine a real Cheese and Onion Sandwich through and through. I started with a Cheese and Onion bread roll. I added some margarine spread. I added the main ingredient, Seabrooks Cheese and Onion Crisps, the Pièce de résistance if you like! I squirted a spiral of mayonnaise onto the top of my roll (optional of course) and voilà! My sandwich was complete. Serve with salad and leftover crisps (I know there is usually no such thing as “leftover crisps but you don’t need to put the whole pack in one sandwich!). Mmm. I have to admit it was very delicious even if I do say so myself. The crunchy roll, crispy crisps, flavoursome cheese and strong onion just taste so lovely together and the mayonnaise just heightens this combination of flavours for me. Do you like a cheeky crisp sandwich, what’s your favourite recipe? Seabrooks have been asking Crisp Eaters to create the perfect crisp sandwich in celebration of National Crisp Sarnie Week.